Window crystals are recognized by a large diamond shaped window in the center of the crystal. The window actually becomes the seventh face of the 4 points of the diamond intersecting with the main angles of the crystal, In other words the top point of the diamond connect with the line leading directly up to the termination, the side points connect with angles forming 0pposiing faces, the bottom paint leads to the termination running down to the base of the crystal. Window crystals are distinguished from regular diamond-faced crystals in that the window is clear and big enough to see into the most inner world of the crystals. In window crystals the diamond is large enough in relationship to the faces comprising the termination to be considered a face in and of itself, creating a crystal with 7 faces instead of 6. 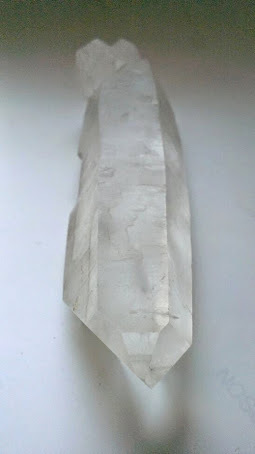 This empowers the window crystal with a dimension of being not known among other members of the quartz family. Window Crystals are like open windows to the soul through which one can see beyond illusionary identities and into the essence of the self. They will reflect the soul, in doing so often mirror the darker shadows of fear and insecurity that inhibit the soul's expression of light. In this way they become very powerful teachers. They are like Gurus in that their reflection is so clear that they simply return the image of yourself. 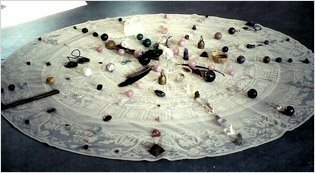 Windo crystals are empty and egoless, and provide a means for which one can see into the deeper regions of the being. The window crystal is a very personal crystal and grows in power the more it is used. They very easily become personal meditation partners as they make you want to go inside, be quiet and witness yourself they directly reflect the individual that is consciously working with them. They will reflect all of the persons light back to them as they will reflect the shadows of the subconscious. They are honest and don't discriminate which parts to reflect back. The window crystal is unique and specialized in its field.